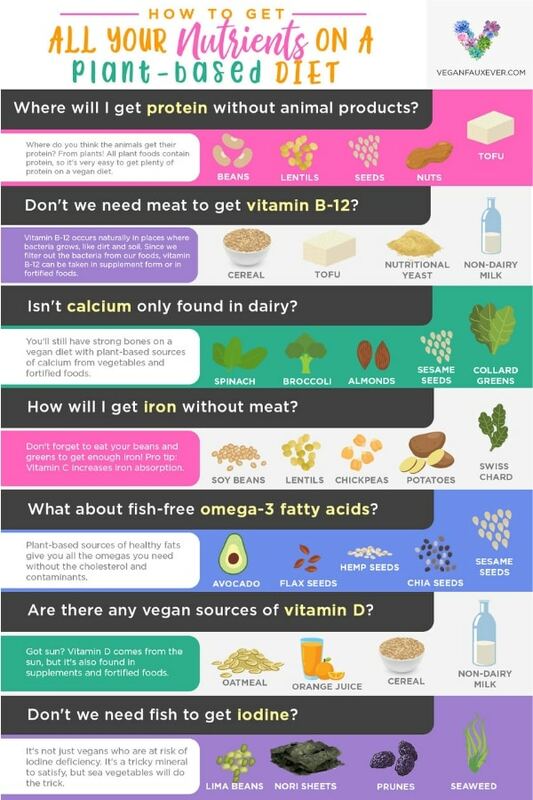 Worried about nutrients like protein and calcium as a new vegan? To get you started, here’s your complete guide to vegan nutrition. When you go vegan, everyone becomes a nutritionist. And the first thing they tell you is that the words “vegan” and “nutrition” don’t go together. There’s a common misconception that getting all of your nutrients on a vegan diet is difficult or even impossible. People tend to think that protein and iron are only found in meat and calcium is only found in cow’s milk. This couldn’t be further from the truth. The reason why you shouldn’t be concerned about nutrient deficiencies on a vegan diet is because unprocessed plant foods are dense with nutrients. Where do you think farmed animals get their vitamins and minerals from? Their food is made from plants! Sure, if you’re living off white bread and Oreos (which are accidentally vegan! ), there may be cause for concern about your nutrient intake. And that’s another misconception people make about vegan nutrition: Just because something is vegan, doesn’t mean it’s healthy. So, if you’re making a conscious effort to pack in nutrient-dense plant food, you don’t need to obsess over tracking nutrition as a vegan. If you’re a new vegan, tracking your nutrients may be helpful in the beginning, but it’s not required long-term. Don’t we need meat to get vitamin B12? How do vegans get calcium without cow’s milk? How do vegans get iron? Don’t we need fish to get iodine? The answers to these questions shouldn’t be a mystery, so let’s dive into vegan nutrition by busting some common myths. When I went vegan three years ago, the first thing people said to me was, “But how will you get enough protein?” As a vegan, you’ll just have to get used to answering this common question. First-world societies are obsessed with protein. America and other countries associate protein with meat. We’ve been conditioned our whole lives that healthy protein sources only come from chicken breast, salmon, and other “lean” cuts of meat. So, when someone announces that they no longer consume those foods, eyebrows are raised as people try to figure out where in the world you could get protein without meat. First, let’s start by discussing where protein comes from. This may come as a huge surprise, but all protein comes from plants. Yes, that’s right. All protein is initially made by plants. It’s not necessary to eat animal tissue in order to get protein. Only plants have the ability to take nitrogen from the air, break those molecules apart, and incorporate that nitrogen into amino acids to make protein. Any protein you get from an animal is simply recycled plant protein. Be sure to watch the What The Health documentary on Netflix for the full clip of Dr. Milton Mills discussing protein on a vegan diet. When you realize how much protein you actually need per day, the idea of getting enough protein becomes less scary. You’ll soon realize you don’t have to obsess over consuming massive amounts of protein at every meal because it’s nearly effortless to meet your protein requirements. Our protein requirements are way lower than we think. Based on these figures, the average person should aim for 15-20g of protein per meal. If you’re unsure how to get that much protein per meal on a vegan diet, we’ll go over vegan protein sources next. Ever heard of black beans, red lentils, hemp seeds, chickpeas, and quinoa? If you didn’t realize these plant foods are full of protein, you need to check out this list of 20 vegan protein sources that will change the way you view protein forever. Some other examples include tofu, tempeh, and vegan meat replacements usually made from soy or wheat. The short answer is that vegans get protein in everything they eat. This is because all plants contain protein, even lettuce. Throughout the day, the amount of protein you consume adds up from all the foods you eat, whether it be smoothies, salads, or veggie burgers. Did you know that livestock animals are injected with vitamin B12 shots or given vitamin B12 supplements in their food? This is why animal products contain a lot of vitamin B12. Vitamin B12 isn’t naturally occurring in animals, so animals must get this nutrient somehow. This means that meat eaters are supplementing with vitamin B12 without even realizing it. Once you cut this food group out of your diet, are you more at risk of vitamin B12 deficiency? Possibly, but it’s not just vegans that should be concerned about vitamin B12 deficiency. Nearly 40% of Americans are deficient in vitamin B12, yet only 3% of Americans are vegan. Strangely enough, vitamin B12 occurs naturally in places where bacteria grows, like dirt and soil. Since we filter out the bacteria from our soil, food, and water, the vitamin B12 is stripped from the places where it would normally occur. This means that all people must get vitamin B12 from supplementation. Some people get vitamin B12 as a secondary source from animal products since those animals were supplemented with this nutrient. Why not skip the animal products and just take the vitamin B12 supplement? 1. Taking an oral vitamin B12 supplement. This is one of the easiest and most effective ways to make sure you don’t become one of the 40% that are deficient in vitamin B12. Supplements are affordable and accessible. Depending on the potency, you may have to take a vitamin B12 supplement on a daily or weekly basis. Many vegan multivitamins like these ones also contain vitamin B12. If you’re already taking a multivitamin, just one take one that contains this important nutrient for vegans. Vitamin B12 injections are so common because they’re believed to boost your metabolism, making them popular among people who want to lose weight. You can find local clinics who offer affordable B12 injections on Groupon. This may be a good option for people who don’t want to take a daily or weekly supplement as B12 injections are administered infrequently. Many animal products are fortified with vitamin B12, but there are plenty of vegan foods that are also fortified. If you choose to go this route, make sure you’re consuming multiple servings of these foods per day. The bottom line is that vegans need to take vitamin B12 supplements in some form or another. Whether it be tablets, injections, or fortified foods—make sure you’re getting vitamin b12 externally and regularly. We’re (literally) fed the idea that cow’s milk is the best or only source of calcium. As a society, we know so little about nutrition that some of us can’t even name another source of calcium. To give you an idea, let’s go over some vegan sources of calcium. Notice how they’re all plant-based foods. Vegan nutrition myths like the ones surrounding calcium are widely spread because of how reliant we are on animal products. How many times have you heard that you need to drink milk in order to have strong bones? Surprisingly, drinking more milk is associated with more bone fractures and osteoporosis. As long as you’re consuming plenty of leafy greens and even fortified foods like plant milk and tofu, you shouldn’t have to worry about getting enough calcium on a vegan diet. If you’re trying to kick milk to the curb, check out this guide to 100+ alternatives to your favorite animal products, which includes vegan alternatives to dairy products. When searching vegan nutrition facts, it’s easy to fall down the rabbit hole and fill your Amazon shopping cart with tons of supplements. Calcium shouldn’t be one of them. Vegans do not need to take calcium supplements. With a little effort, you can get all the calcium you need on a vegan diet. Just consume adequate amounts of leafy greens, nuts, and plant milks. If you’re still in the market for a vegan calcium supplement, this is the one I recommend. The calcium comes from algae, and it’s made from whole foods. Meat, especially cow’s meat or beef, is heavily associated with iron. After protein, a huge concern that people have about vegan nutrition is iron. Iron deficiency is one of the most common nutrient deficiencies in the world, which is why anemia is so common. When you cut out meat, people automatically assume you’re at risk of becoming iron deficient. The truth is that both non-vegans and vegans are at risk of iron deficiency—not because of how much iron they’re consuming, but because of how much iron they’re absorbing. Non-vegan sources of iron are usually foods that are high in protein like steak, chicken, and seafood. Similarly, vegan sources of iron are also typically high in protein. Generally, you can get iron from a wide variety of plant foods. Legumes, grains, and seeds are the big ones. Surprisingly, blackstrap molasses is known for being an excellent vegan source of iron. Some nutrients are absorbed better when combined with other nutrients. This just means that certain foods complement each other because of their nutrient content. This is kind of like taking black pepper to activate the immune-boosting properties of turmeric root. Combining vitamin C with iron is another such food combo that increases absorption. So, how does one combine iron and vitamin C properly? Simply combine the above-mentioned iron sources with fruits and vegetables. Should vegans take iron supplements? Unless your iron levels are extremely low, the answer is no. You do not need to take an iron supplement on a vegan diet. Like many supplements, too much iron can have a negative effect on the body. If you’re anemic, iron-deficient, or need to take an iron supplement for health reasons, look for one made from whole foods. The multivitamins by mykind Organics contains iron from their whole foods blend. This is a good vegan iron supplement, too, as it contains both iron and vitamin C. It also contains vitamin B12 and folate. Fish oil supplements have taken the reigns when it comes to the omegas. Some people take straight fish oil, such as cod liver oil, or take gel capsules. Pescatarians and meat eaters also get their omegas from salmon, tuna, and eggs. Healthy fats are a super important part of a vegan diet, and they usually contain plenty of omega-3 and omega-6. Spoiler alert: There are plenty of vegan sources of omega-3 that don’t involve fish. How do vegans get omega-3? Omega-3 fatty acids are called “fatty” for a reason. Notice how the go-to sources are all high in fat! The same is true of vegan sources of omega-3 fatty acids. Notice a trend? Almost all of these are nuts and seeds. With the popularity of omega-3 supplements derived from fish oils, it’s important to discuss the dangers of those products. Whether you consume oily fish or fish oils in supplement form, you may be risking heavy metal contamination. Fish are known to contain dangerous levels of mercury, for example. New research also suggests that fish and other marine life are contaminated by microplastics, which are associated with physical and chemical toxicity. Vegan omega-3 is more sustainable with no risk of heavy metal toxins. What about EPA and DHA on a vegan diet? EPA and DHA are two omega-3 fatty acids that are key for human health, especially during pregnancy. There’s controversy that the vegan diet doesn’t provide adequate amounts of EPA and DHA. Non-vegan sources of omega-3 contain EPA and DHA, but vegan sources don’t. Instead, the vegan sources contain an omega-3 called ALA, which is converted to EPA and DHA by the body. Should vegans take omega-3 supplements? Vegans don’t need to take omega-3 supplements, but they should understand how to satisfy this need on a vegan diet. As mentioned, the body converts the ALA in plants to EPA and DHA. However, this process isn’t super efficient. Even if you’re consuming plenty of nuts, seeds, and other healthy fats, your body may not be producing significant amounts of EPA and DHA. There is a vegan solution: Algae and sea vegetables. You see, the reason why fish and fish oils are high in omega-3 fatty acids like EPA and DHA is because their diet consists heavily of algae. Continue to consume vegan omega-3 sources like flax seeds and walnuts, but add some seaweed, nori sheets, and dulse flakes, too. You can find sea vegetables in the Asian section of most grocery stores, Amazon, and online health stores like VitaCost, Thrive Market, and iHerb. If you’re pregnant or advised to take omega-3 supplements, make sure the omega-3 is derived from algae. There are plenty to choose from, but I like this one. Vitamin D is like vitamin B12—it’s a nutrient that we don’t really get from food. Humans get vitamin D via sun exposure just like we get vitamin B12 from bacteria. That isn’t to say that you can’t get these vitamins from food. Many foods are fortified with certain vitamins that are more difficult to get on any diet, not just a vegan diet. Vitamin D is tricky, so let’s get into it. Many people think that vitamin D is created by the sun. While the sun plays an integral role in the creation of this vitamin, it’s actually our bodies that create vitamin D. We just need the sun’s help to enable our bodies to do so. Because so many people use sunscreen or stay inside for long periods of time, vitamin D deficiency is pretty common. An estimated 42% of Americans are deficient in vitamin D.
Vitamin D is also found in fortified foods like cereal and juice. Dairy products like milk and yogurt are fortified with vitamin D, which is how most non-vegans get their vitamin D. They also get this vitamin from seafood, which is naturally high in vitamin D because their bodies create it. Since humans can get vitamin D from either sunlight or fortified foods, there are plenty of options. You just need to put in a little effort. Vegans get vitamin D like non-vegans—from sunlight or fortified foods. Should vegans take vitamin D supplements? Getting enough vitamin D via sunlight exposure alone is tricky. If you go outside without sunscreen, you risk sunburns, free radical skin damage, and increased risk of skin cancer. If you go outside with sunscreen, you prevent your body from creating vitamin D with the help of sunlight. This is a classic catch-22. Because of this, getting vitamin D from the sun may be unreliable. Your best bet is to consume plenty of foods enriched with vitamin D or take a vegan vitamin D supplement. Many vegan multivitamins contain vitamin D, like this one, or you can take vitamin D on its own. There are plenty of vegan vitamin D supplements, but I always recommend mykind Organics. The mykind Organics Vitamin D tablets get vitamin D from lichen and a whole foods blend of mushrooms. It’s not that vegan sources of iodine are hard to find—they’re out there—there’s just not many of them. Most people get iodine from dairy products. It’s actually pretty shocking how cow’s milk ends up so high in iodine. Basically, before the cows’ udders are hooked up to the milking machine, they are pre-dipped in an iodine sanitizer. That’s pretty extreme. Instead, try some vegan iodine sources. As you can see, many vegan iodine sources are sea vegetables. There is iodine in plenty of fruits and vegetables, but the amounts are very small. Sea vegetables are the most reliable source of iodine for vegans. Should vegans take iodine supplements? No, vegans do not need to take iodine supplements. Instead, vegans should incorporate sea vegetables into their diets several times per week. You don’t even have to consume sea vegetables at every meal or every day. This video on NutritionFacts.org shows you how little sea vegetables you should eat to meet your daily requirements. Pregnant vegans, however, are advised to take iodine supplements to prevent deficiency. This vegan prenatal vitamin contains 100% of your daily iodine needs from whole foods. You can also take vegan kelp tablets that are high in iodine. The average person doesn’t know much about nutrition in general, let alone vegan nutrition. Once you get past the topics of protein, iron, and vitamin B12, there may not be much to discuss because that’s where most people’s understanding of nutrition drops off. Selenium is a mineral that can be difficult to get on a vegan diet. The most potent vegan source of selenium is brazil nuts. Try to consume a couple of these on a regular basis. Steel cut oats, nutritional yeast, and quinoa are also great vegan sources of selenium. A vegan diet can be virtually free of cholesterol unless you are consuming lots of vegetable oils. Oils aren’t necessary, and many plant-based physicians advise against them because they are high in saturated fat. Your body creates all the cholesterol it needs, so you don’t have to worry about getting cholesterol from food. Instead of focusing on protein, focus on fiber. An estimated 97% of Americans don’t get enough fiber. Don’t be one of them! A vegan diet is naturally high in fiber, but you can make sure to reach your target by consuming a variety of legumes, grains, vegetables, nuts, and seeds. Soy won’t hurt you. Foods made from soy, like tofu, tempeh, and vegan meats, and even soybeans can be part of a healthy vegan diet. Try to get organic, non-GMO soy when possible as soy is one of the largest GMO crops. Dr. Michael Greger of NutritionFacts.org often publishes science-backed articles on the health benefits and safety of soy. One micronutrient that should be on your radar is potassium. 98% of Americans are deficient in potassium. Vegan sources of potassium include lima beans, navy beans, potatoes, avocados, bananas, and leafy greens. Finally, protein, which is the last nutrient you should worry about on a vegan diet. Protein deficiency is extremely rare because there’s protein in ALL plant foods, even lettuce. Need more inspiration? Here are 20 vegan protein sources you should incorporate into your vegan diet. Vegan nutrition is a fascinating topic because most of what we’re told about nutrition is exaggerated or false. You don’t need meat to get protein and you don’t need milk to get calcium. You don’t need nearly as much protein as you think you need, and you could likely ramp up your fiber intake. 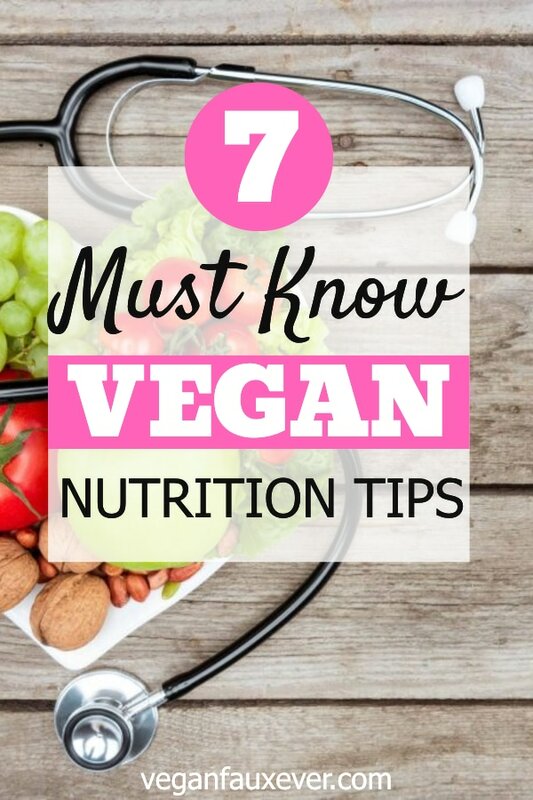 Hopefully these vegan nutrition myths and facts have helped you to understand nutrition in general but especially as it applies to a vegan diet. My favorite vegan nutrition resource is NutritionFacts.org. Dr. Michael Greger publishes high-quality videos and articles on nutrition topics based purely on scientific evidence. Dr. McDougall is another vegan doctor with a website full of free and credible vegan nutrition information. He recommends a whole foods diet with an emphasis on starches. Plant-based physician Dr. Neal Barnard founded the Physicians Committee for Responsible Medicine (PCRM.org). There you can read about the latest research on nutrition topics. The bottom line is that vegan nutrition facts are usually surprising. We associate calcium with cow’s milk, iron with steak, and omega-3 with fish. We’ve been conditioned to believe that most of our nutrients need to come from animal sources, and therefore, we are setting ourselves up for nutritional deficiencies if we adopt a vegan diet. That rationale is simply not true. It’s time to bust these vegan nutrition myths and open our eyes to the abundance of vitamins and minerals in fruits, vegetables, legumes, grains, nuts, seeds, and so on. Your best bet for avoiding nutritional deficiencies on a vegan diet is to eat a variety of foods and supplement when you’re supposed to. Many people, vegan or not, suffer from nutritional deficiencies. Don’t let it get that far. Eat your leafy greens, consume plenty of plant-based whole foods, and take a vitamin B12 and vitamin D supplement when necessary.